Visiting the Bitterroot Valley from Missoula is easy. 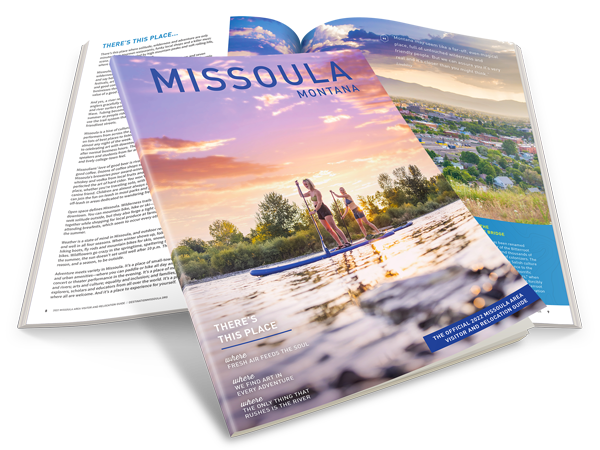 The valley stretches 90 miles long directly south of Missoula, making it the perfect destination for a day trip. The Bitterroot Valley is home to charming small towns, plentiful outdoor recreation and several historic highlights. Take a slight detour off of Highway 93 to Lolo Hot Springs. Lolo Hot Springs Resort is on 125 acres of private property in the middle of the Lolo National Forest, 37 miles southwest of Missoula on Highway 12 West. Lolo Hot Springs Resort features a saloon with live entertainment, a restaurant, a gallery, and natural mineral hot springs pools. Designated in 1964, the refuge was created to provide habitats for migratory birds. The 2,800 acres of lush riparian and wetland habitats attract a variety of wildlife. About 250 species of birds, 37 species of mammals, and 17 species of reptiles and amphibians have been documented on the Refuge. Darby is located on the Bitterroot River and was the terminus of the Northern Pacific Line. Crumbling log buildings with two-story false front attest to its life in the gold dust days. This town is the film location for the tv series "Yellowstone." As you head back north on Highway 93, take a right turn onto the Eastside Highway 269 in Hamilton. Daly Mansion Road will be two miles down the road. Marcus Daly, an enterprising Irish immigrant, purchased the Anthony Chaffin homestead in 1886 to serve as his family's summer residence. In 1896 he built the imposing Queen Anne style Victorian mansion the family referred to as Riverside. In 1910 his widow, Margaret, renovated the mansion to its present Georgian-Revival style. The Daly Mansion has over 56 stunning rooms, with 25 bedrooms, 15 bathrooms, and 7 fireplaces, 5 of which have imported Italian marble. The three-story, 24,000-square-foot mansion is situated on 50 tree-planted acres in the heart of the Bitterroot Valley. As you continue on Eastside Highway 269 you'll hit the town of Stevensville. In Stevensville you can stop and visit the beautiful Historic St. Mary's Mission. Historic St. Mary's Mission is the story of remarkable people in a turbulent time and the assimilation of two very different cultures against the backdrop of the American Frontier. Walk through history and see, touch, and hear this fascinating, controversial, and important chapter of this nation's past.